As some of you may know, Xiu Xiu is one of my favorite bands! For the release of their new album, lead singer Jamie Stewart is writing a haiku for the first 200 people who send them a picture of themselves holding the album. I’ll let you guys know if I get a haiku! Here’s the link so you can get your own. & also, buy the album, because it’s really good. Seriously, Star. Way to sultr-ize the internets. 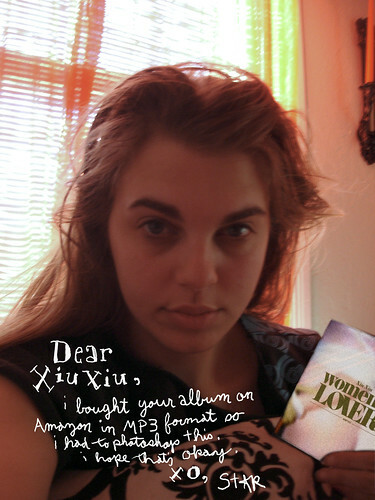 Xiu Xiu’s Women As Lovers, or Haikus are rad.